A long, long time ago, my kids were studying countries of the world for social studies. It was, by far, our favorite school year. When we got to the country of France, I decided to have a fancy meal and invite friends over. I knew I wanted to make chicken cordon bleu but needed a side dish. That’s when I found this recipe and I’ve been using it ever since! Easy. Inexpensive. Microwave friendly. This is a flexible recipe. Precise measurements are not needed. Peel the potatoes and using a sharp knife cut very thin slices. You want the slices to be round. You can almost see through the slices. 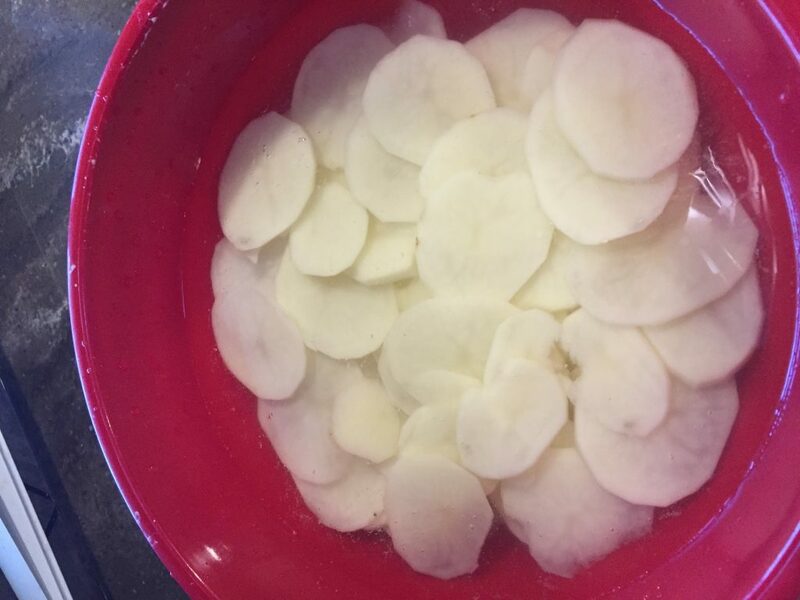 Place the potato slices in a bowl of cold water. Find a square glass dish or smaller casserole dish. Grease with butter or spray. 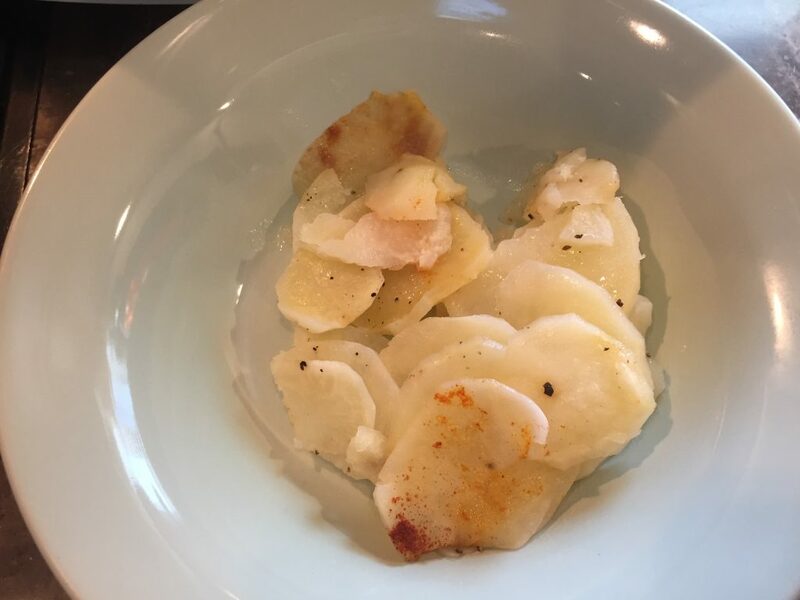 Place potato slices in a single layer in the dish. It is ok to overlap the edges to form a solid surface. Continue to make layers just like this. Stop and use the salt and pepper at least twice while making layers. Sprinkle salt and pepper over a layer and then continue layering. When you get to the top and all the potatoes are in the casserole dish, sprinkle with salt and pepper and a pinch of paprika. Cut the butter into small pieces and place on the top. Using a spoon, sprinkle 2 Tbsp. of milk into the crevices so it will run down into the layers. Cover tightly with plastic wrap. 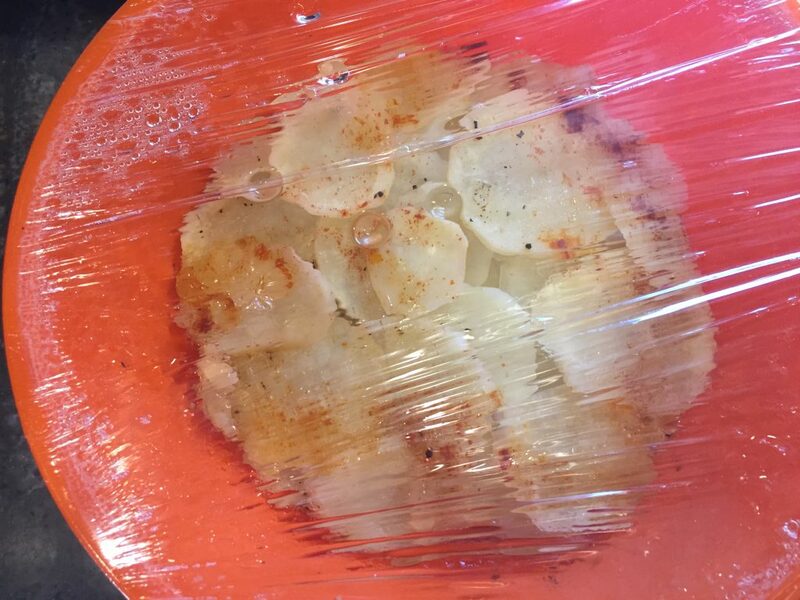 Pierce the plastic wrap in several places to let the potatoes steam. Place in the microwave. Cook on HIGH for 13 minutes. Let stand for 5 minutes, covered, before serving. I made this on grocery shopping day. 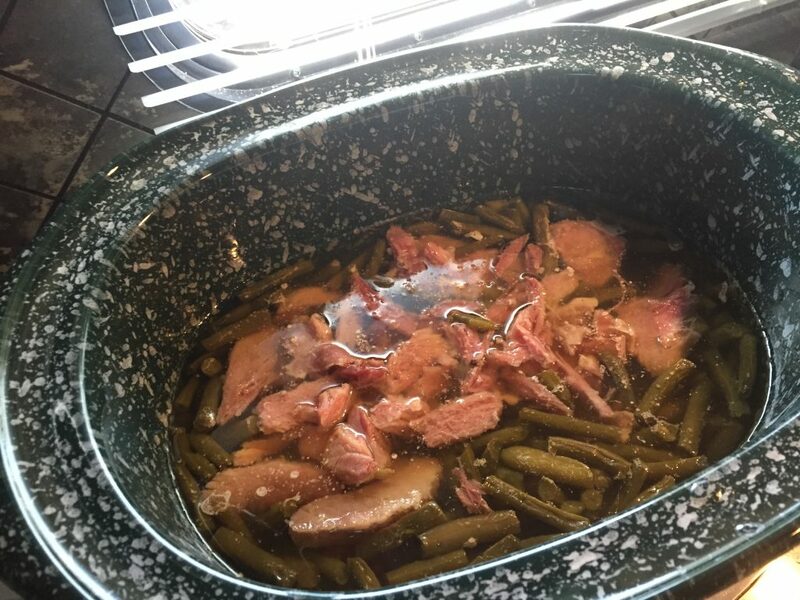 I had a ham bone in the freezer so I put that in the slow cooker with a little water and set it on low. 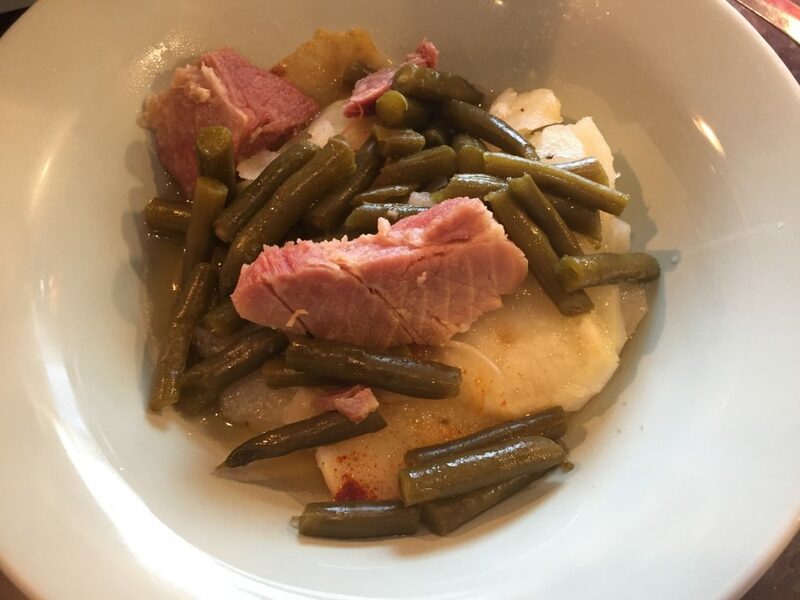 When I came home, I cut the meat off the bone and put a large can of green beans (with the juice) in the slow cooker. I left the heat on low for the rest of the day. I also added 1 Tbsp. of powdered chicken broth granules to the beans and ham. I made the french potatoes right before dinner. I put the potatoes in a bowl and then added beans, ham and broth to the bowl. This is a very easy and inexpensive dinner. 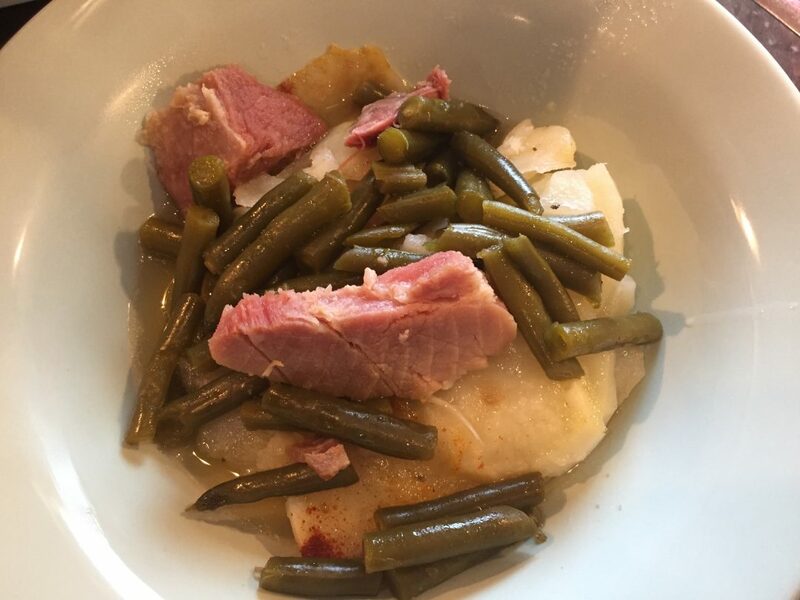 I already had the ham bone and potatoes, so I only paid for the large can of green beans. Try it! 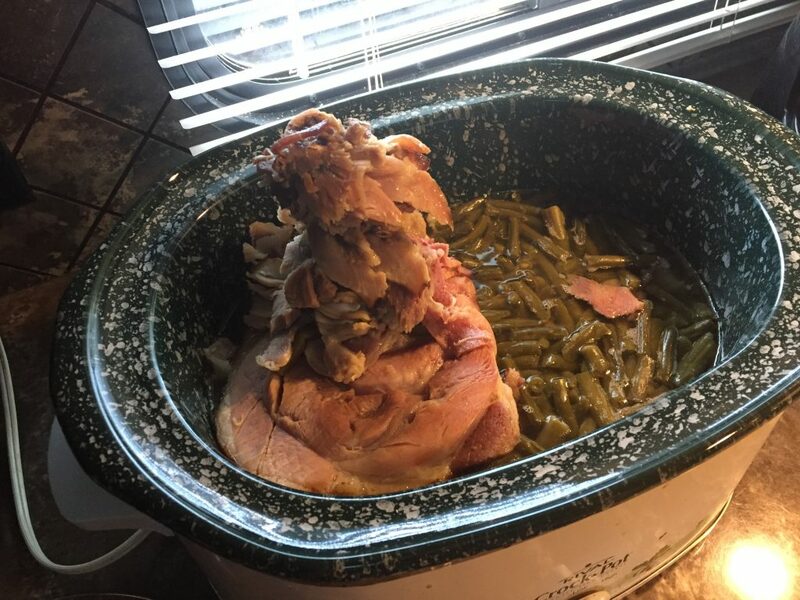 Place the ham bone and a small amount of water in the slow cooker. Set to low. After 2-3 hours, pull the ham bone out. 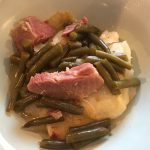 Cut all meat off the ham bone and return to the slow cooker. Add 1 large can green beans with juice (do not drain). Add the chicken broth granules, if desired. Continue cooking on low until ready to eat. Peel the potatoes. 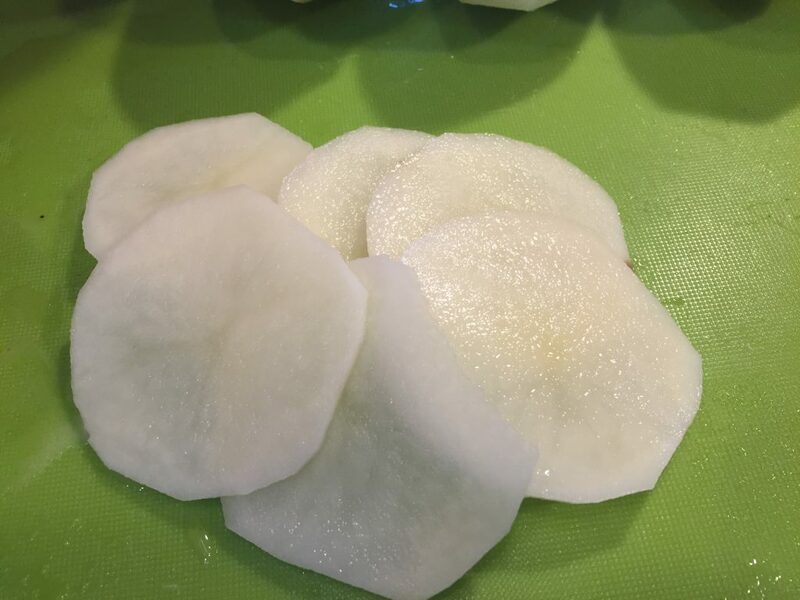 Slice very thin rounds and place all potato slices in a bowl of cold water. When all potatoes are sliced, grease a square or oval microwave-safe casserole dish. 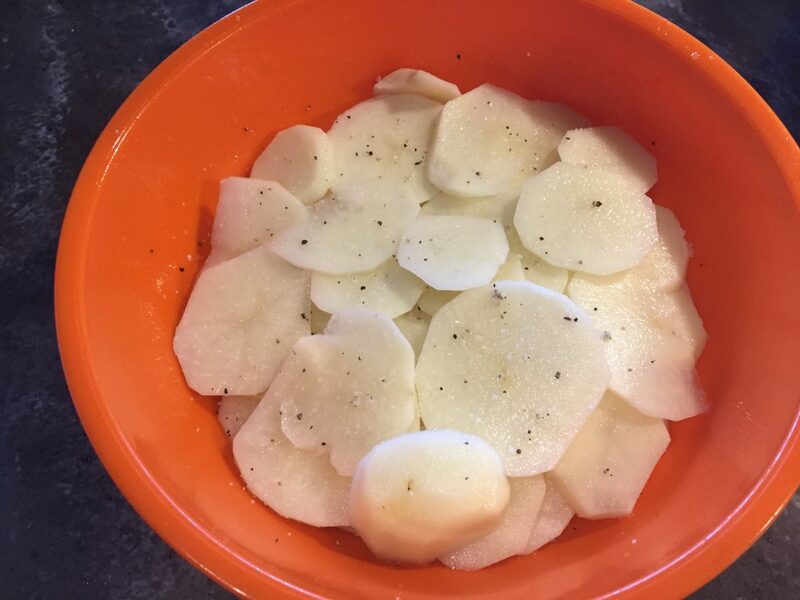 Place potato slices in even layers, stopping twice while layering to sprinkle with salt and pepper. 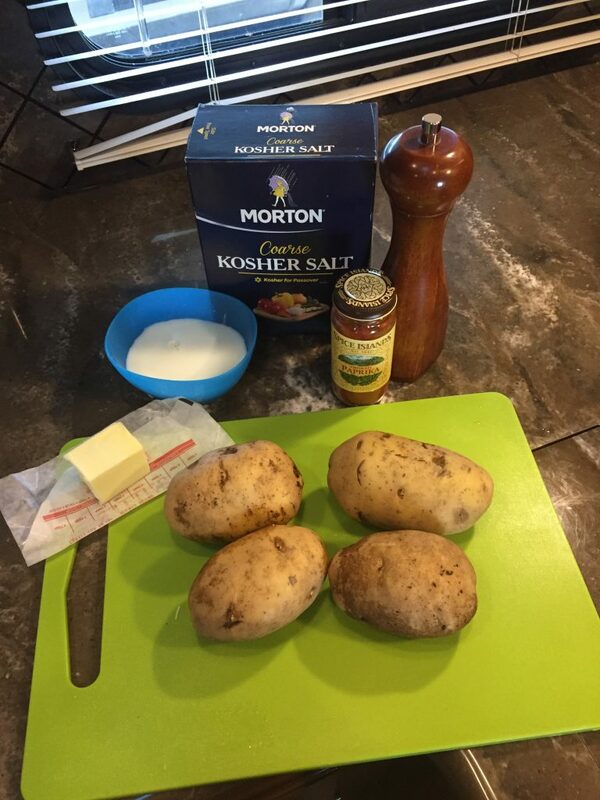 When all potatoes are in the dish, sprinkle one last time with salt and pepper. Sprinkle with a pinch of paprika. Cut butter into small cubes and place on the top. Spoon the milk over the top, aiming for the crevices so that the milk runs down into the other layers. Cover with plastic wrap. Pierce the plastic wrap with a few holes to let steam escape. Place in the microwave and cook on HIGH for 13 minutes. Remove from the microwave and let stand for 5 minutes before uncovering and serving. 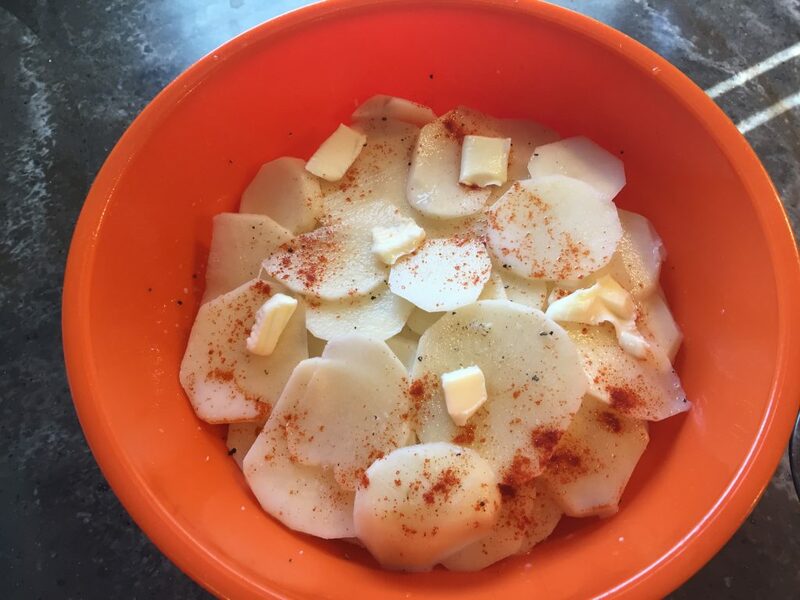 After the potato slices are cut, this would be a great recipe to have your kids help with. They can sit with you and layer the potatoes. If the kids do help, pre-measure the salt and pepper so that they don’t go crazy. This is an easy dish to take to other people and works very well in an RV kitchen. Enjoy!